I’ve been trying to get my head around the different kinds of connections that people establish with other people and things on the Web. I need a framework, so I thought I’d try to classify some of the most popular mechanisms according to the criteria that set them apart. The Foursquare-like check-in isn’t represented because it really isn’t a persistent connection (when I check in to Arby’s my intent isn’t to create a connection to that place). The check-in is more a peer of “tweet” than “follow”. A service like Digg is another mechanism that is related, but doesn’t represent a persistent connection. The good old hyperlink is a candidate. Not in general, but in some places (like the blogroll) they definitely represent a social connection. I’m going to leave them out on the basis that a relatively small fraction of mainstream users create a lot of hyperlinks. Must the connection be approved by the target? Does the connection indicate affinity with the target? Is the target of the connection a person? Is the point of the connection to publish it to others (“I’m a Radiohead fan!”)? Do we expect the target to push content to us? Do we expect the connection to be public? Does the connection help us to organize people or things? Does the number of incoming connections confer status on the target? At this point I don’t need these to be mutually exclusive (or for the math geeks, orthogonal) and clearly some of the questions are related. For example, number 5 (publishing) and number 7 (public). Here are answers for the 5 F’s. Note that I’m trying to capture the typical intent and expectations associated with each connection. For example, it is possible to set up a private Twitter account where followers need to be approved, but this is atypical. And your Facebook friends might send you messages, but the primary intention of connecting with them isn’t to receive push content. I distinguish between explicit (full Harvey ball) and implicit affinity (empty ball). Quora is generalizing the follow metaphor to things as well as people, but I’m ignoring that for now. Although Twitter isn’t primarily for publishing information, many people use it this way. They are much more interested in broadcasting something to their followers than reading the tweets of others. Reciprocal friend models often restrict the visibility of your connections to those who are connected to you. So they are typically public, but sometimes only within a group defined by first or second degree connections. A model is only as useful as the insights it generates. The first thing that struck me when I sat back and looked at my info-scribble was that despite being an incredibly simple mechanism, Twitter is very versatile. It brought to mind Mike Arrington’s recent scrap with Dave Winer about Twitter replacing RSS as a source of traffic to TechCrunch. Twitter is clearly a simpler user experience than RSS and feed readers, but perhaps another reason for its popularity is the sheer amount of utility people get out of it. Of course, being versatile has a price and Twitter is sub-optimal for most things. The next thing that jumped out at me was the loneliness of reciprocal, approved connections. I can’t think of any up and coming social web apps after Facebook and LinkedIn that use these. Is the future about looser, more fluid connection graphs? The source escapes me, but I read an article recently about people, particularly younger people, having more and looser connections. Actually, this article that I can’t re-find after 10 minutes on Google is a good example of another (fairly obvious) thing that the model illustrates: these different mechanisms can be complementary. I found the article because someone tweeted it, but I didn’t use anything to mark it as a favorite. I suppose I could have used Twitter’s favorite feature, but I’m not in the habit of doing that. I use Marco Arment’s Instapaper to mark the things I want to read later. A combination of Twitter (follow) and Instapaper (favorite) has completely replaced RSS (feed) in my reading “workflow”. Then there is the question of taxonomy. 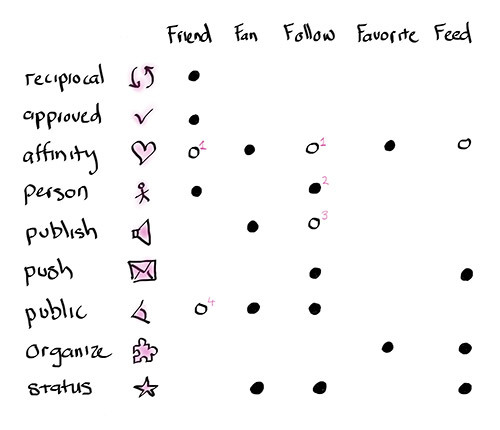 Right now it is a bit of a mess, with words like “friend”, “follow” and “favorite” having different meanings in different applications. I’m sure apps will get more mutually consistent over time. Are things going to settle out with a single verb for all connections, where the nature of the connection is determined by its target? This is the Quora model, where one can “follow” virtually anything. Or are we going to settle out with a small group of verbs that each carries a distinct meaning (the 5 F’s, for example). That’s my starting point. Now I need to read what other people have written on the topic. I don’t have comments enabled here, but please tweet (@gregorysean) if you have any pointers. If you have more detailed comments, like suggestions for additional dimensions, or even a completely different way of framing this, reach me at gregorysean@me.com. Posted: January 23rd, 2011 under The Social Web.